Is there any way to browse the file system of a currently running or just killed iOS simulator? I'd settle for being able to see a specific app's files if there's a way to do that. Note that I don't want to do this programatically. I want to see/open the files in the Finder. It had directories for all models of simulators (4.0, 4.1, 5.0, etc) you have ever run, go to the one you are running from in Xcode. I go there often enough I keep the iPhone Simulator directory in my Finder sidebar. 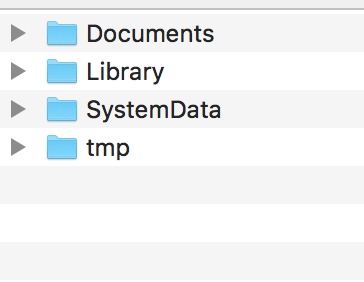 Note that with iOS8, the simulator folders are in a totally different directory - really split across a few directories, with folder names for application specific files that change each time you run your app. Open the program "Activity Monitor", search for your App (just the apps name, not the simulator), click "Informations" and open "Open files and ports". Copy the second entry (something like /Users/me/Library/Application Support/iPhone Simulator/4.2/Applications/B97A9504-0FA5-4826-BB6D-A2335A676459/VSGradientView.app/YourApp). This is the running app, while <...>/B97A9504-0FA5-4826-BB6D-A2335A676459/VSGradientView.app/ is the bundle, and <...>/B97A9504-0FA5-4826-BB6D-A2335A676459/* the sand-boxed folder. If you pass this as open "/Users/me/Library/Application Support/iPhone Simulator/4.2/Applications/B97A9504-0FA5-4826-BB6D-A2335A676459/" to the terminal, the folder will open in Finder. There is a nifty app that also supports the XCode 6 simulator. It is awesome, use it! Run print(NSHomeDirectory()) and copy the path. Alternative for 1. is to catch a breakpoint and do po NSHomeDirectory() in console. Old post, but I think it is worth mentioning SimPholders to find your Simulator files. It is a menu bar item that tracks your simulator apps and lets you go directly to their folders and content. It's super awesome. Based on @zsero answer, I made a short bash script which directly opens the simulator folder of your application id. Very handy! Not the answer you're looking for? Browse other questions tagged iphone ios nsfilemanager or ask your own question. Where are apps stored in XCode? What's a quick way to test to see a file exists? Xcode Simulator: how to remove older unneeded devices? Is any way to get the current screenshot?